This book is a first of its kind, and it will probably forever remain the only one of its kind. The purpose of this book is to draw people closer to Jesus while providing a much clearer picture and a better understanding of the greatest story ever told. The accomplishment of this book may just ‘make history’ in the publishing world. Tracking Jesus Step By Step through the Gospels is a chronology of the life and ministry of Jesus in the most accurate possible harmonization of the 4 Gospels. 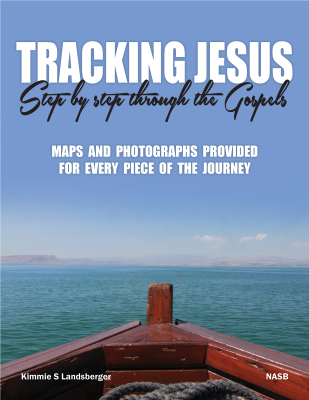 Tracking Jesus Step By Step through the Gospels will take any Bible reader through the Gospel stories in a way they never have journeyed before. Every change of location or change of scene in the book begins with a map showing the change of location and authentic photographs for each place to make this book very reader-friendly and easy to follow. Other miscellaneous authentic photos are also included in many of the sections amidst the Scripture text. Painstaking thought was put into every detail, with the priority of story flow being placed above book order. No details were missed on any of it. Even the photographs I would not settle for anything less than 'perfect' on. For example, in the story pieces that took place on the Sea of Galilee, the boat on the sea is facing the same piece of land Jesus and His disciples were looking at in the story... Photographs of fish were really out of the Sea of Galilee... Every detail has been well researched and carefully thought through. It is the easiest way--and the most authentic way--for anybody to journey through the Gospels. In essence, this book give the readers clarity. It also helps the Gospels to feel more REAL to them, as they are pulled into the stories with maps and photographs of everything along the way, and just pure Bible Scriptures to take them there.